Director Tim Burton (Edward Scissorhands, Alice in Wonderland) turns Disney’s animated classic into a live-action film that is both a remake and a sequel. 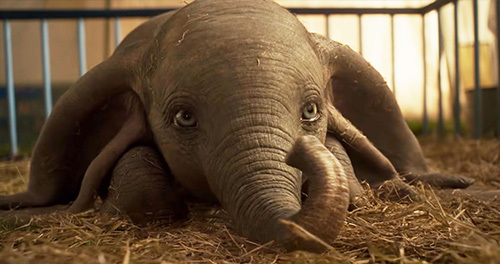 Dumbo follows the original story in broad strokes, with Danny DeVito running a down-on-its-luck traveling circus where a baby elephant with enormous ears is born. At first, the baby is considered a freak. 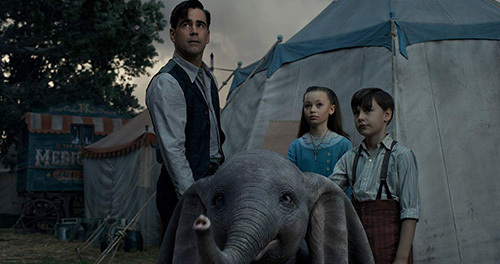 But two children of a returning war veteran (Colin Farrell) catch a glimpse of baby Dumbo’s potential and help him learn how to fly. During his first performance in front of a crowd, Dumbo gets frightened and his mother tries to protect him from the boisterous crowd. The sequence escalates to a point where Dumbo’s mother is labeled ‘mad’ and locked away from the rest of the circus. This is when Burton gets to recreate what I consider one of the most heartbreaking scenes in motion picture history — when little Dumbo wanders to his mother’s locked train car and the two reach for one another with their trunks through a small barred window. The original animated film makes me bawl at this point. The live-action version is more restrained, but still very effective. And don’t worry — the beloved song, “Baby of Mine,” is included both here and during the film’s end titles. 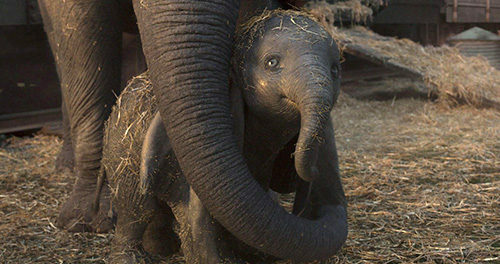 Dumbo’s mother is sold off in another emotional scene, with the circus’ close-knit community banding together around Dumbo and promising her that they’ll take good care of him. From that point forward, Dumbo is about reuniting a baby with his mother — just as soon as the circus makes enough money to buy her back. Halfway through the film, Michael Keaton shows up playing a wealthy amusement park creator, a la Walt Disney. And he really, really wants Dumbo to perform at his park. So DeVito makes a deal and the entire troupe moves to Keaton’s ‘Dreamland’, a sprawling, art-deco complex full of roller coasters, rides, attractions, and shows. At first things seem great. But there’s a dark side to Keaton and his ambitions. Soon enough, Dumbo and his circus pals begin to feel the pressure to perform, the weight of capitalist enterprise, and a blatant disregard for animal and human welfare. What’s worse, is that Keaton has Dumbo’s mother chained up as a scary sideshow attraction. When he realizes she’s a distraction to Dumbo, he orders her death. Dumbo‘s final act is about the circus troupe rescuing the mama elephant and escaping from Keaton’s Dreamland. Yes, Burton and writer producer Ehren Kruger (The Ring, Arlington Road) are clearly mocking the Disney Empire with the last half of the film. But it’s not really what Dumbo is about. 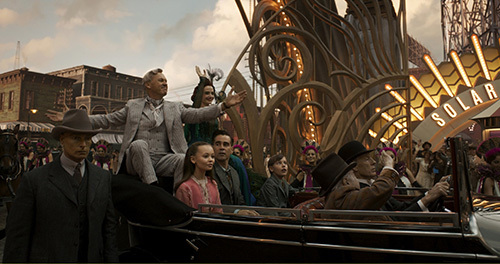 Dumbo is about what all Tim Burton movies are about — freaks. Dumbo’s ears make him a freak and the circus becomes his surrogate family of freaks. Even handsome Farrell returns from war missing an arm. The first half of the film is about finding solace among like souls, while the second is about the perils of exploiting that which makes us ‘freaky’. When it comes right down to it, Dumbo is about compassion and empathy, and doing right by all the other living souls on this planet we all share — whether they are freaks or not. I really enjoyed this Dumbo. I would have liked more humor in the movie. The pacing drags just a tad in the middle, and a more clearly defined main character might have streamlined the story’s focus a little better. But I fell in love with the character of Dumbo from the moment I first saw him, and I wanted nothing more than to see him reunited with his mother. Burton integrates all the best parts of the original film without getting cloying, and he creates emotional moments without overdosing us in sentimentality. He also adds his own, viscerally thrilling final act to the story. I fell in love with Tim Burton after Beetlejuice, Batman, and Edward Scissorhands. And then he made his masterpiece, Ed Wood. But since 2000, I’ve really only enjoyed Big Eyes. Is Dumbo a return to form for the director? I think he’s still a bit stifled under the weight of Disney enterprise. But Dumbo is certainly a step in the right direction. It’s probably my favorite Tim Burton movie since 1999’s Sleepy Hollow. With Eva Green, Alan Arkin, and Roshan Seth.